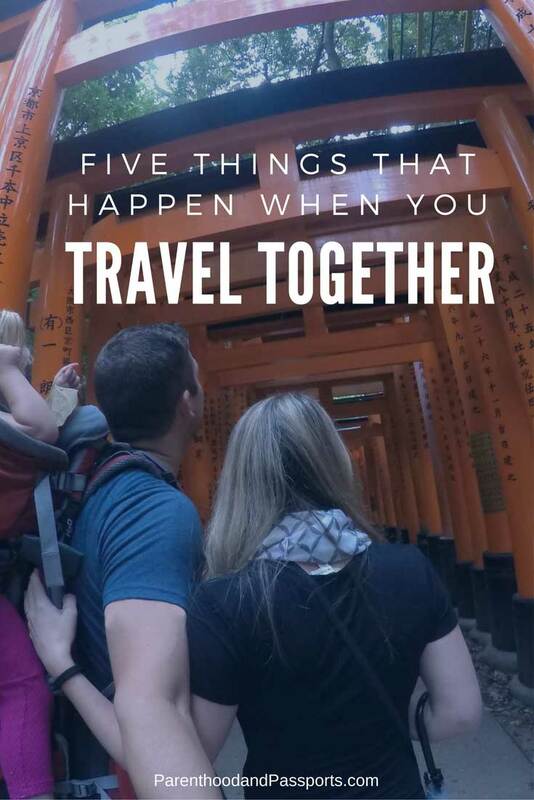 Traveling with your spouse can be an incredible thing. It’s in those moments when you are together in a foreign country that you truly learn the most about each other. The good, the bad, and the ugly sides of your significant other’s personality will inevitably come out. You see someone’s true colors when they are stressed, jet-lagged, totally out of their comfort zone, and surrounded by everything unfamiliar. And if you are self-aware enough, you will see your true colors, too. The truth is, traveling as a couple isn’t always pretty. Traveling can bring couples closer together, but it can also challenge relationships in ways you never expected. Still for me, traveling is one of the greatest experiences I get to share with my husband. It certainly helps that he is almost unnaturally patient and laid back. (Seriously, it’s weird how chill he is.) I, on the other hand, am neither patient nor laid back. 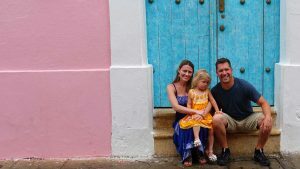 In our five years of traveling together as a couple, and now with a child, I’ve realized there are a few things that happen on almost every single trip. This may not happen on a short weekend trip, but chances are if you are spending a couple of weeks or more traveling together, you will piss each other off at some point. Keeping it real here. No marriage is perfect and there is not a couple on this planet who doesn’t argue. When you’re traveling as a couple, you spend a lot of time sitting together in planes, trains, subways, and restaurants. Naturally, you are going to talk to each other a lot more than usual. One of you will inevitably do or say something the other thinks is rude or inconsiderate. You’re going to get on each other’s nerves. Throw a bit of crankiness from the jet lag and a week of poor hotel sleep into the mix and you’ve got an argument on your hands. Don’t worry, and don’t think too much of this fight because it won’t last. Traveling as a couple definitely has more ups than downs. You may walk the beach alone for an hour or go to sleep mad at each other one night, but eventually you’ll make up. In fact, you’ll probably make up sooner than you would at home because you’ve got places to go and things to see! Traveling as a couple forces you to reconcile because you don’t want to spend your entire trip not talking to each other. You will both want to see the sites and experience a new place. And let’s face it, doing so together is better than doing so apart. Usually, in our experience, the argument will be forgotten or at least dropped the next day. Whether it’s getting ridiculously lost in Venice, skiing your first double black run, or crossing the border into a new country, you will share experiences that you’ve never shared with anyone else. Those experiences will lead to a unique bond that is tighter than the lid on a jar of jam. (Side note: Why do they make those jars so dang hard to open?!) When I first laid eyes on the Roman Colosseum I was overwhelmed with amazement. But something even more special happened when I glance to my right. I saw the same look of wonderment in my husband’s eyes. We looked at each other, both with huge smiles, and without any words, we shared a moment. I have mentioned before that my husband is my perfect match. While we have a lot in common, we are also different people in many ways. Traveling with him has made me appreciate him more. I appreciate his patience, as I mentioned earlier, and how he keeps his cool in stressful situations. Trying to navigate the public transportation system in a city where everything is written in another language while you have a toddler trying to squirm out of your arms is beyond stressful. Yet, my husband handles it with poise. I also appreciate his love of adventure. He is always willing to go with the flow even when I plan crazy trips to places without electricity or WiFi. He is my rock in so many ways. And when we travel that is most apparent to me. When you travel with your spouse, you will appreciate their presence. You will appreciate having someone familiar next to you when you in those awkward moments when have no foreign currency and credit cards aren’t accepted. And you will appreciate all of those small qualities about them that you take for granted on a typical day. Every couple has those mundane conversations where you recount your work day or talk about what you ate for lunch. When you become parents, all those conversations get replaced with conversations about your child’s poop. No really, parents talk about poop a lot. Our daughter’s bowl movements have dominated our conversations since we enter the ranks of parenthood 2 1/2 years ago. But luckily, when we aren’t talking about poop, we have some incredible conversations about where we’ve been and where we want to go next. When you travel with your spouse, you have really great stories to tell about adventures all over this phenomenal planet. That time we climbed the Great Wall of China in the freezing rain or the moment I almost broke my leg following my husband down a ski run are now funny tales that we recount to our friends. And because we are constantly planning our next adventure, we also have these amazing conversations about life goals, bucket lists, and what we want to experience before we depart this great planet. I’m not a marital counselor, so please take what I’m about to say for what it is… unsolicited advice from someone totally unqualified to give it. I realize that not everyone has the same experience when traveling with a significant other. Sometimes the fight doesn’t end. Sometimes you don’t make up. Sometimes the bond is broken, not strengthened. And sometimes your traveling story is not a fairy tale… it’s a nightmare. 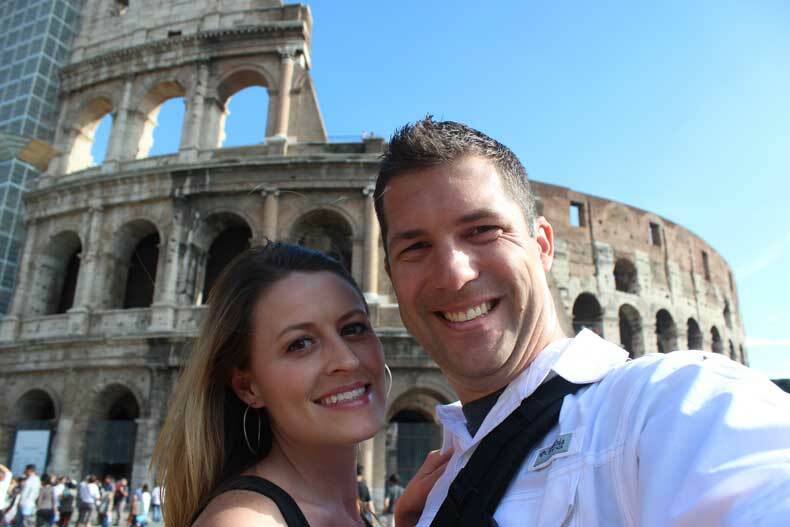 Traveling with your spouse or significant other will reveal their dark side… and yours. You will see each other in moments of weakness. And you will learn whether those weaknesses are things you can truly live with and accept. If you have already said “I Do” before realizing your spouse is not a compatible travel partner, it’s OK to say “I Don’t” to traveling together. I have several friends in happy, healthy relationships that travel separately. Over time, they have realized what works for them. And you too will realize what works for you. Do you enjoy traveling with your spouse or significant other? 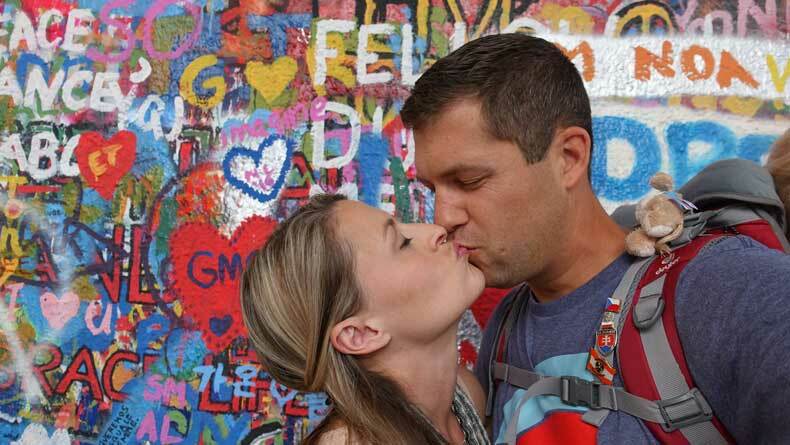 What have you learned traveling as a couple? Leave us a comment and let us know. Absolutely! I had a friend who came back from a trip on the verge of divorce ask me how my husband and I travel together without fighting…. I had to be honest and tell her we argue on every single trip. You learn more about someone in 2 weeks traveling then you do in a year together at home. This is spot on! We always have at least one big fight. But I mean…you’re together 24/7… bound to happen!! It is! Spend 24 hours together for weeks on end and you WILL get on each other’s nerves. Yeah, there are definitely more great moments than bad ones on trips, otherwise no couple would travel together. But there is always that ONE moment that completely tests your relationship. So true! I wouldn’t trade traveling with my spouse for anything in the world. I feel like our experiences and stories give us an amazing bond! Thanks for sharing! They do! Because only that one other person can relate to certain experiences you’ve had. Love this! I’ve been traveling with my husband for over 20 years now. It’s funny. We bicker like crazy on short trips but we recently took a 6 week extended trip to Southeast Asia and got along perfectly the whole time. Shared stories can be a double-edged sword. My husband runs a travel meet-up here in Dublin where we talk about travel over drinks. If I’m late he’s told all our best travel stories to the other attendees before I get there. LOL. Thanks again for sharing your experiences. 6 weeks and not a single argument! Impressive! I can totally relate to the husband telling all the good travel stories, too. When we’re traveling, my husband is always faster to post on social media and every time he posts a picture, it always happens to be the exact one I was about to post. Since we have a lot of mutual friends, it seems pointless to post the same picture. ? Totally agree with all of this. I would add another – you learn new things together which helps learn more about each other too. My husband and I have been traveling together for 10 years and it’s the best thing we do. Oh I so appreciate this post! 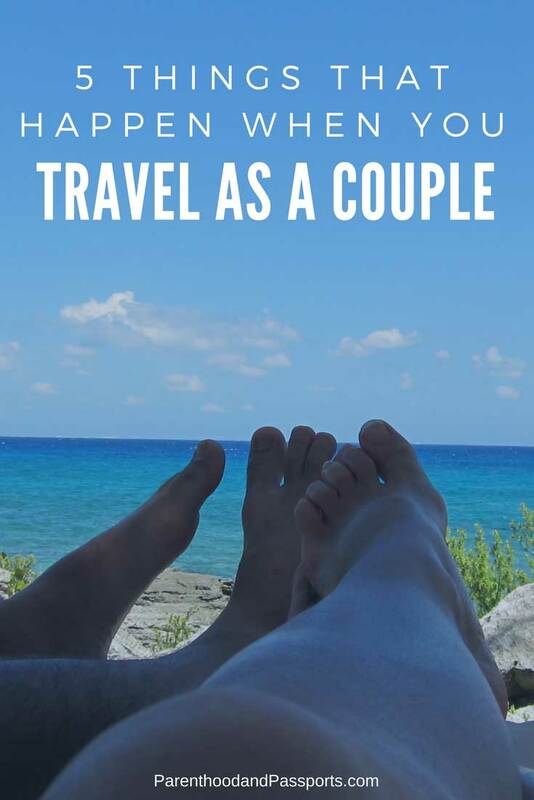 I often think about that when traveling with my husband! It’s definitely amazing and wonderful, but also challenging and humbling! We see each other at our worst. So important to share these experiences though! Thanks for the real, authentic post! Yes, I feel like traveling together challenges us so much, especially when you add a kid into the mix. But luckily, our relationship always ends up stronger after a long trip. Can totally relate to this. I used to like travelling solo but have been abroad with my partner a few times now and it definitely takes some adjustment. We have a lot of fun too though so it generally makes up for any arguments! The good definitely outweighs the bad. It’s so refreshing to hear so many other couples say they argue on trips, too! We spent 8 weeks traveling together and loved it! I love all of the memories we made. I agree about appreciating each other more too. Thanks for sharing! 8 weeks abroad would be awesome. We don’t have that much paid time off, unfortunately. I bet it was an incredible trip! My husband and I retired in 2010 sold our house and bought a big ole 5th wheel and traveled the whole country along with our schnauzer. There are so many places that are beautiful here in the states, one of which is Oregon. We ended up staying there for two months in the summer. Sadly we are not traveling anymore. My husband health was not good, he has early onset dementia. I was glad to hear Damon is calm and laid back on trips, since I depend on his calmness on bad weather day. So sorry to hear about your husband’s health. I’m glad you two got to travel together for a few years and see the states. I agree there are so many beautiful places in the US. Neither Damon nor I have made it to Oregon yet, but we keep talking about how we need to visit soon. It does help! My husband and I were actually friends for 7 years before we dated. We went on trips along with several other friends, so I definitely knew we would be great traveling companions in marriage, as well.